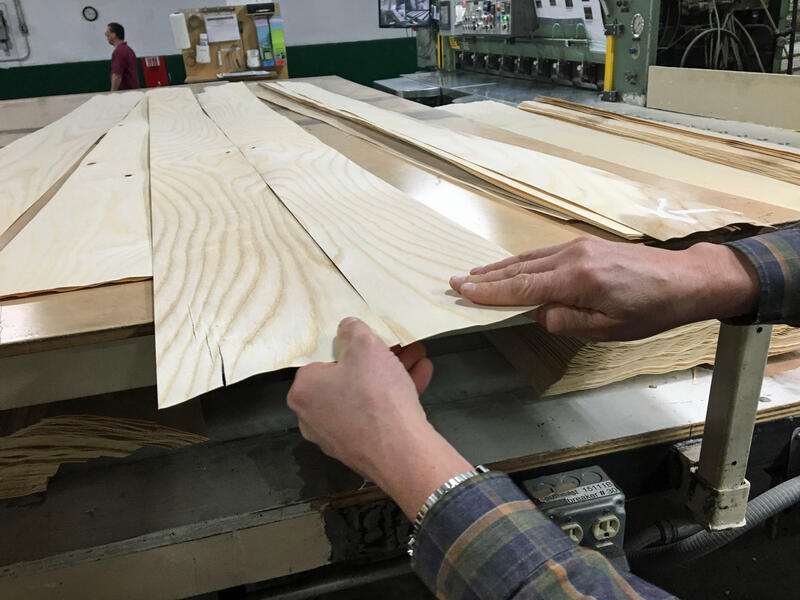 A Northeast Kingdom manufacturer is anticipating a swift upturn in business, now that the United States has imposed a steep tariff on Chinese plywood. At the Columbia Forest Products plant in Newport, mill workers turn hardwood logs into paper-thin veneer for plywood. As logs work their way through the production process they are debarked, trimmed and rolled through a cutter set to 25-thousandths of an inch. Then, in one long sheet, a log's worth of freshly-cut veneer goes through a dryer and rolls onto the line to be graded and trimmed. Ever wonder what it would look like if you sliced a tree paper-thin then rolled it back up? Take a look! Glenn Foster has been working at the plant for 22 years. He is manager of safety, compliance and engineering for Columbia Forest Products' veneer operations. "It’s like an MRI of a tree, because you see the whole thing, you know every 25-thousandths of an inch, every revolution," he explains. "How did that knot appear? How did it get cut off and grow over and heal? You’ll see scars that come and go. Grub holes – you know, insects will bore into the wood and those sort of defects will come and go through the life of the log, really. Most of these logs are probably 50-100 years old." 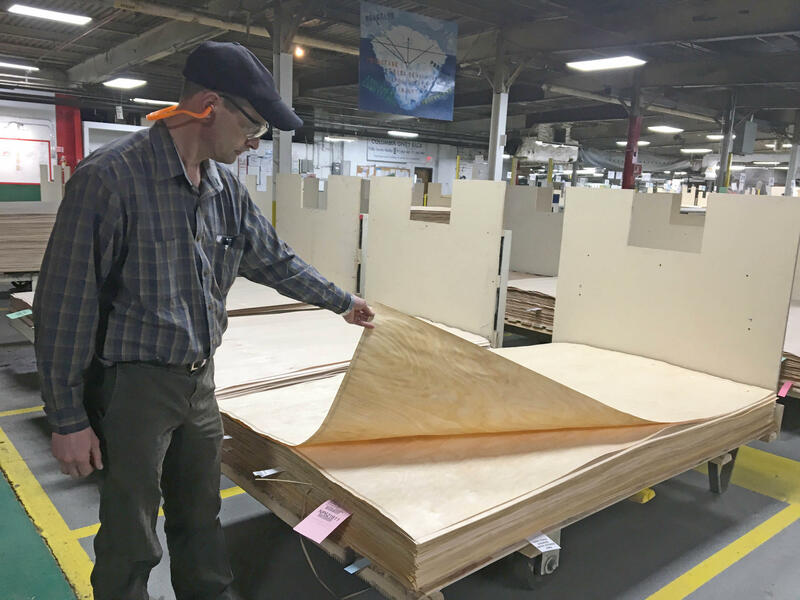 Glenn Foster lifts a sheet of hardwood veneer that will be sent to another Columbia Forest Products Plant to become the face of a piece of plywood. About 200 people work at this plant and at Columbia’s offices nearby. The plant operates with two shifts, but it was running three shifts before the recession. Gary Gillespie is Columbia's executive vice president for its Canadian Plywood and Decorative Veneer Operations. He says business should have bounced back during the economic recovery, but instead the market was flooded with under-priced Chinese imports. "The economic indicators that would allow the hardwood plywood usage to go up dramatically – it happened during the recovery," he says. "But what happened is, since 2009 or '10 when the use of the hardwood plywood started to rebound, the Chinese gobbled all that growth up and then some." So U.S. manufacturers like Columbia teamed up to fight back. They appealed to the federal International Trade Commission to step in. "So what was our, in the old days, our competitors, because we enjoyed a lot of the market – a much bigger part of the market – turned into allies that filed this suit and it was a very collaborative effort, you know because we were all, all harmed," Gillespie says. "It was easy to rally the troops, so to speak, in that respect." "The government builds these little factories, towns – little cities – that produce volumes and volumes of hardwood plywood, in our example," he says. "So, that’s what they do. They target industries and they make it very clear what they’re after and the government supports them with unfair support." Glenn Foster demonstrates how two strips of veneer can be bookmatched to make an appealing grain pattern. As a result, Gillespie says the Chinese were able to dominate the market within a decade and a half. The U.S. manufacturers first petitioned the federal International Trade Commission to intervene and impose tariffs four years ago, but that complaint was denied. They filed again about a year ago and this time the ruling went their way. Vermont Rep. Peter Welch testified before the commission in both cases, and rallied the support of other lawmakers. He says the unanimous U.S. International Trade Commission decision is good news for Columbia and the Northeast Kingdom. "They saw their orders decline as the dumping increased," says Rep. Welch. "They always have been able to compete on quality, but they couldn’t compete on price against the Chinese government subsidizing the cheaper imports. So now I think Columbia and the Kingdom are in a much better position to compete, to succeed and to expand employment." Columbia’s Gary Gillespie says the company operates 13 plants in the United States and Canada. Like the Newport facility, the other plants are also in rural areas where good jobs like Columbia offers can be hard to come by. "We pay at the top of the manufacturing level," Gillespie says of the plant jobs. "We’re employee-owned, for Columbia, which means that everybody gets a nice retirement program, which is kind of unheard of these days, and healthcare benefits." While it's too soon to say exactly how many jobs Columbia will be adding in Newport, Gillespie says those job openings could start coming before the winter is over. Developers of Swanton Wind have decided to put the project on hold. The move has opponents of the project cautiously optimistic. For seven years a citizen’s group has been fighting a proposed supermarket in the Chittenden County town of Hinesburg. The battle went all the way to the Vermont Supreme Court and it’s still not settled. When the Twin Valley Senior Center's freezer died, nearly 400 "Meals on Wheels" had to be tossed. But Director Rita Copeland was determined not to let her homebound clients miss a meal.